Palm Springs is known not only for its eclectic mix of inhabitants but mostly for its amazing modern style with a touch of hollywood glam and a nod to old world charm. The houses here are the perfect blend of modern and vintage, of elegant and rustic and most importantly they ooze personality. If you are in the midst of redecorating or simply interested in pinpointing what it is that makes these spaces so special here is a list of a few finds that designers are always keeping an eye out for to help turn any ordinary room into an extraordinary space that feels unique, trendy and soulful. 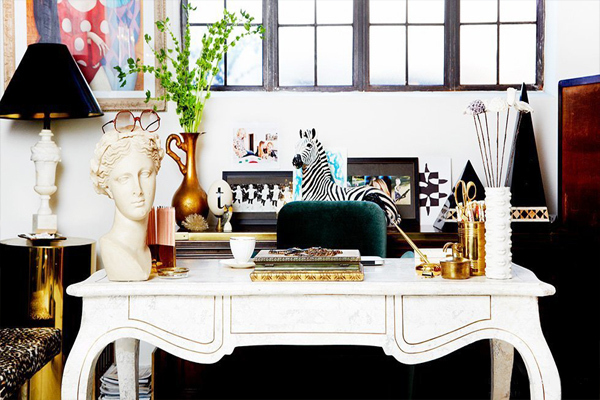 1) Busts - Busts are a great way to add a little bit of old world sophistication to any modern space. They can be used in a multitude of ways and come in many shapes and sizes! 2) Trunks / Luggage - Who doesn't love a nice old trunk? There is just something magical about luggage and trunks that fills you with you a sense of mystery and adventure! 3) Brass Animal Figurines - These gems are great for a kids room or as tabletop decorations! 4) Lamps - We all need lighting in our houses so you might as well have light fixtures that speak to your personal style! I love a nice geometrically shaped or patterned lamp with block colors! 5) Antlers - Ok, so maybe these don't technically qualify as vintage BUT, I've looked at enough house tours to know that these things are definitely in style and have a certain badassery too them, they look great mounted on a wall or on a bookshelf!